If you’re already using Facebook ads, you probably know about lookalike audiences. This feature lets you show your ads to people whose demographics, interests, income level, or other attributes are similar to your existing customers. 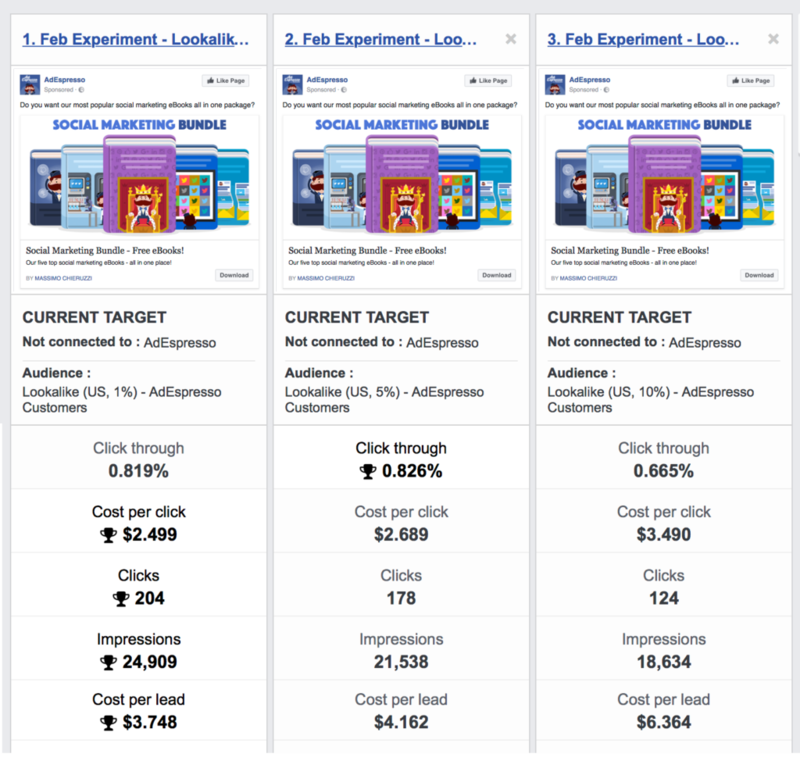 When you’re creating your Facebook Lookalike Audience, you can choose from a range of percentages. 1% are those that match your source the most accurately. It’s the closest match, but it’s also a smaller group of people. The 5% and 10% options are a little more divergent, but also an opportunity to reach more people. So which is actually best? 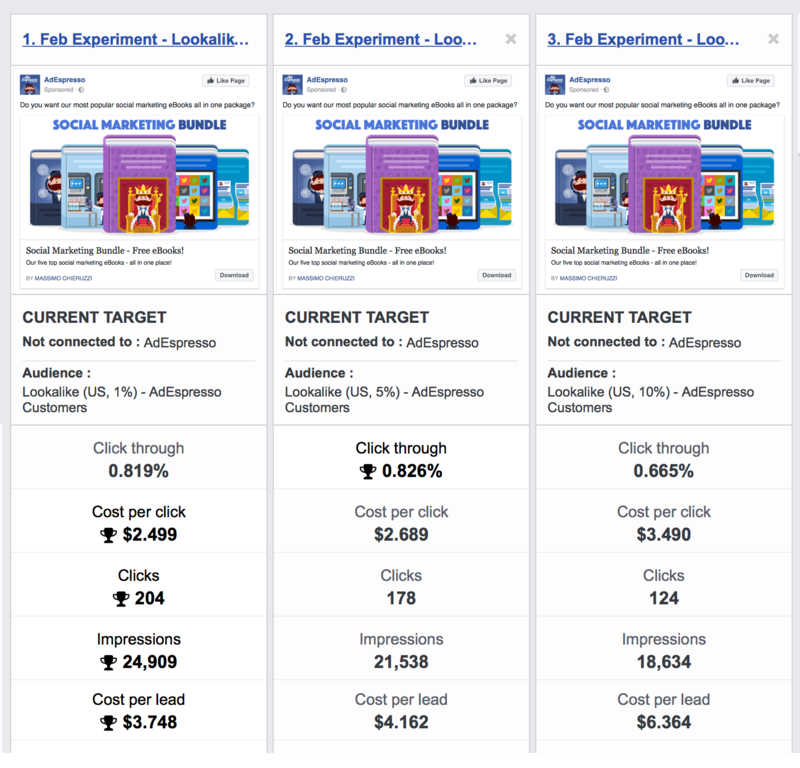 Recently, SaaS company AdEspresso decided to run an experiment to find out which group — 1%, 5%, or 10% — had the lowest cost per conversion. Their starting hypothesis was that the 1% lookalike audience would convert the most. They ran a 14-day A/B test advertising their most popular ebooks. To do this, they spent $1500 — a significant sum, but not astronomical. Here’s what they found after the experiment was over. The 10% Lookalike Audience had a 70% higher cost-per-conversion than the 1% Lookalike Audience. As you look at the campaign comparison, there are even more fascinating insights waiting to be uncovered. For example, the 10% Lookalike Audience had a significantly lower CTR than other tested audiences. While the 1% and the 5% Lookalike Audiences had a CTR of 0.82%, the 10% Lookalike Audience delivered a CTR of 0.66%. The Lookalike 1% audience delivered 115 leads and the others less. If you compare the cost-per-lead across all the three ad sets and the fact that each of them had a $500 budget, this was to be expected. Due to a higher cost-per-click, the 10% Lookalike Audience also delivered nearly 40% fewer clicks than the 1% Lookalike Audience. Wrapping it up: the 1% Lookalike Audience outperformed both the 5% and the 10% Lookalike Audiences. That’s what we thought when setting up the campaigns, but now we knew for sure. Key Takeaway: It makes sense to create smaller Facebook Lookalike Audiences as they deliver higher campaign ROI (at least in the short term). According to AdEspresso’s findings, the best way to keep your cost-per-conversion down is to choose the 1% lookalike audience. Despite the fact that it’s a smaller segment of the population, their close similarity to your existing customers generally means they’re more likely to convert. You can read the full writeup about the experiment over at AdEspresso.